Six separate stories follow characters old and new from The New York Times bestselling series Lazarus, shining light into the dark places of the world following the events of the Cull. The world now lies divided not amongst political or geographic boundaries but amongst financial ones. Wealth is power, and that power rests with only a handful of FAMILIES. And now those Families are at WAR. 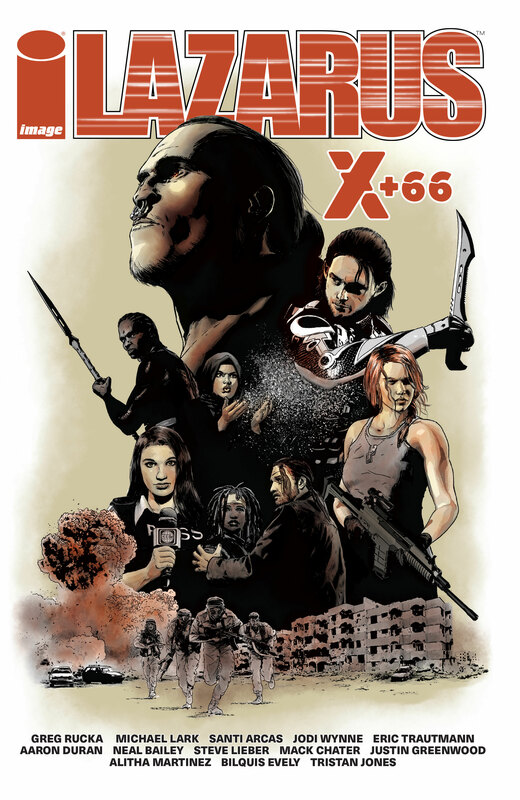 It is the year X +66, and The Conclave War—a global conflict between the Families—has sundered alliances and destabilized life around the world. No one, not Family, nor Serf, nor Waste, has been untouched by the growing chaos. New York Times’ best-selling writer Greg Rucka (BLACK MAGICK, Wonder Woman) is joined by co-writers Neal Bailey, Aaron Duran, and Eric Trautmann along with artists Steve Lieber, Mack Chater, Justin Greenwood, Alitha Martinez, Bilquis Evely, and Tristan Jones—with stunning covers by Lazarus co-creator Michael Lark—to present six stand-alone stories that take us through the Year X +66 and set the stage for events to come.